A little over six months ago, the Minister of Transport, Pascal Donohue, announced that the western end of the Dublin Galway greenway project would be paused to allow local issues be resolved while Kildare/Meath section would get the green light for immediate investment. This article will examine the current status of the project and look at the potential outcomes in 2016. As a background, the Dublin Galway greenway will be Ireland’s first cross-country cycle route covering a total distance of 210 km. The greenway forms a critical part of the Dublin to Galway Euro Velo Route #2 [readers correction] and was announced as a strategic government project by Minister Leo Varadkar in 2012. While the project was strongly supported in the east of the country, problems started to emerge at the western end due to landownership issues. Last September (2015) a report from TII (formerly NRA) was sent to Minister Paschal Donohoe on their dealings to date with landowners in east Galway. This was in the context of pockets of entrenched and organised opposition in east Galway and political lobbying on behalf of the objectors by their local representatives. The report recorded landowners’ concerns and also recorded that there was a roughly 60/30 percentage split against the project as first proposed (i.e. on agricultural land) with the other 10% undecided or unresolved. 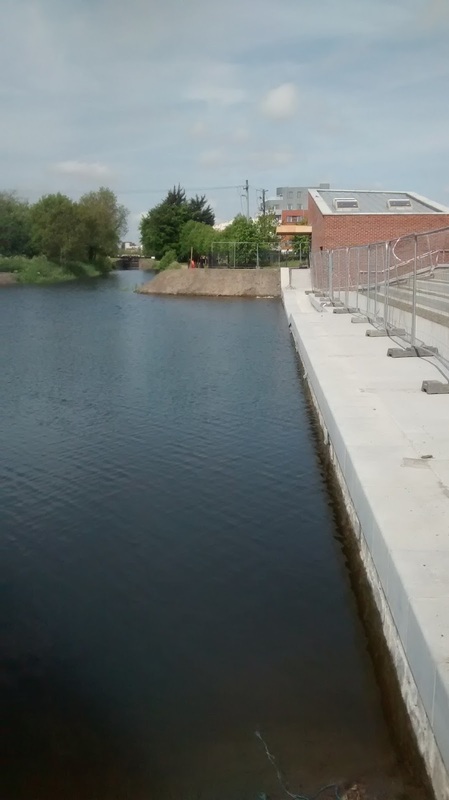 The Minister instructed TII and local authority team members in the West to stand down and suspended work west of the Shannon, announcing that he would be focusing instead on the shovel-ready sectors in the east (primarily along the Royal Canal). So 6 months on from this announcement, how is the project progressing and when will we see Ireland's first coast to coast greenway open? 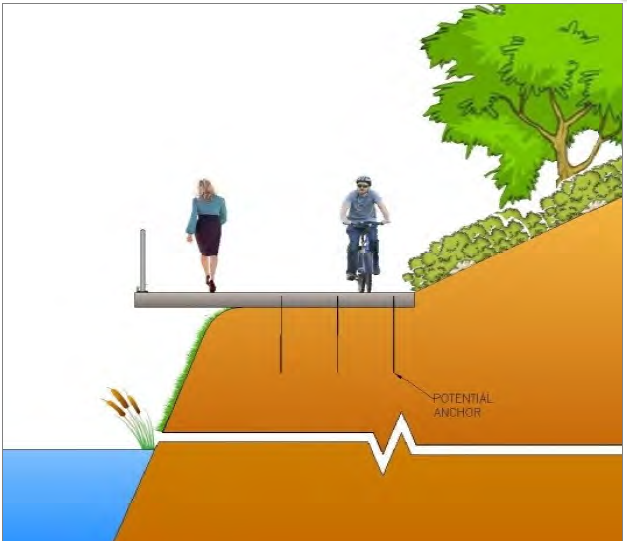 While the Dublin Galway greenway will eventually provide 210km of uninterrupted cycle and walk ways, the route is actually series of smaller connected routes. The greenway crosses 6 counties and will be eventually delivered by 7 local authorities and Waterways Ireland. Each authority is progressing their sections independently under the direction of TII. Work will be undertaken by the local authorities and Waterways Ireland subject to funding from central government. Below we will summarise the progress on each of the greenway sections. · Dublin to Ashtown: 7.1 km in length. Dublin city council are progressing with developing a 7.1-kilometre pedestrian and cycle track from Dublin's Sherrif St to Ashtown in Dublin 15. As reported recently in the Dublin Inquirer the project got off to a slow start but is now moving at pace. The project will be delivered over a number of stages. The public consultation was done and dusted in July 2015 and planning permission has been granted. 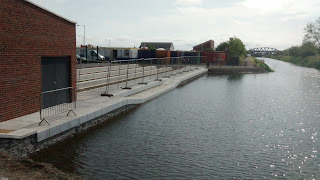 Of the four phases of the Royal Canal project, one is finished and three are yet to be done. The first was a cycle route of 400 metres from Guild Street to Sheriff Street Upper. That bit was actually already done before the plans for the project were drawn up, which then included it as Phase 1. Phase 2 will stretch over 520 metres from Sheriff Street Upper to the North Strand Road. The plan is to include space along the route to accommodate a playground and a skate park. Phase 3 is longer. It’s 2.1 kilometres, to be exact, and continues on from North Strand Road up to Phibsborough Road at CrossGuns Bridge. Under the plans, the route will be resurfaced and there will be a new access ramp at Croke Park. Phase 4, from CrossGuns Bridge to Ashtown, will be even longer: 4.3 kilometres. · Ashtown to Castleknock: 2.5 km in length. The Ashtown to Castleknock section of a proposed coast-to-coast Greenway was officially opened in June 2014 by the then Minister for Transport, Tourism & Sport Leo Varadkar. The €2 million Ashtown to Castleknock stretch is a fully surfaced 2.5km Greenway along the Royal Canal. It has been broadly welcomed as a valuable local amenity for walkers, cyclists and other local residents in west Dublin. · Castleknock to Fingal County Border: According to local sources, Fingal County Council hope to put out a tender in Spring 2016 for the design of plan for the cycleway, starting at the 12 Lock and finishing at the Kildare border. The exact finishing point for this survey is still uncertain and dependent on TII confirming how much funding Fingal has to undertake the design tender. 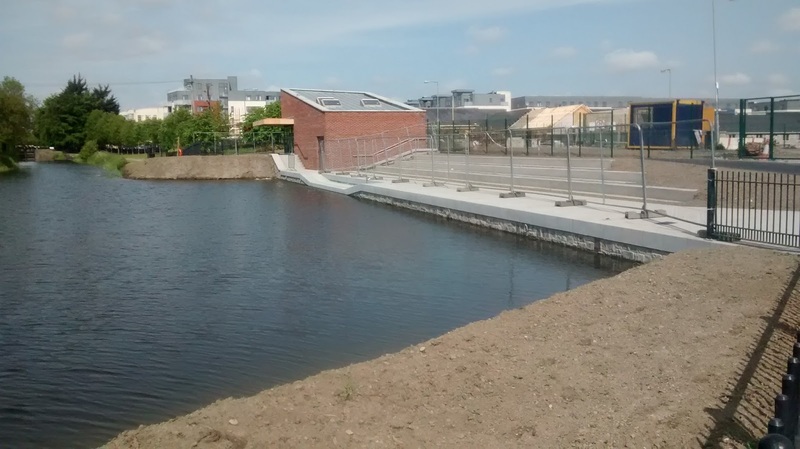 According to authorities, "the engineers in Fingal see the 'Deep Sinking' section as the major blockage in the whole Royal Canal Greenway project and they want it resolved once and for all. Once the design is done, we still have to wait for funding from TII to undertake the actual work." The TII has listed greenways as a priority area for investment and Fingal has identified this project as a priority we are told. · Maynooth to Meath/Westmeath county border: 38 km in length. Royal Canal towpaths. Planning has been approved. The project has been divided into 2 parts. The Maynooth to Kildare/Fingal border and the Maynooth to Meath/Westmeath border. A public consultation process was run in February 2016 with many interested parties calling for the route to be more commuter friendly. Officially we are hearing that construction can commence pending availability of funding. According to local sources we have also heard that there are some rumblings lately that the local authorities may be getting some funding this year to do some of the 38km but nothing is confirmed yet. Vegetation on the tow path was cleared in February 2016 to be ready to go. Sources close to Kildare county council have indicated that a section around Kilcock could be the first part to be tackled in 2016. · Meath/Westmeath county border to Mullingar West: 27 km in length. Royal Canal towpaths. This section was opened in 2014. 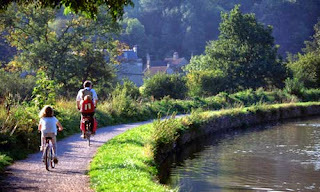 This is an excellent section of the greenway and is regularly used by local people for walking and cycling. · Mullingar to Garrycastle, Athlone: 40 km in length. Disused railway line. This section was completed autumn 2015 and was officially opened in October 2015 by an Taoiseach Enda Kenny. The route has been named and branded locally as the 'old rail trail' and is attracting a lot of users both local people and tourists. It is the center piece in the successful marketing of Athlone as a tourist destination. · Garrycastle to Athlone Marina: 4.5 km in length. Urban environs. The next 4.5km heading west from Garrycastle in Athlone to the Shannon received planning in Dec 2015. An EIS for the new cycle bridge and cycleway as far as Athlone Castle will be submitted to An Board Pleanala next month. West of Athlone Castle to Galway on hold awaiting further instruction from the Minister. · Athlone Marina to Athlone Castle: 0.5 km in length. River Crossing. The Environmental Impact Statement (EIS) for this section which includes a new bridge over the River Shannon, is currently being prepared and submission to An Bord Pléanala is planned. · Athlone Castle to Ballinasloe: 30 km in length. Rural environs; Greenfield. Paused due to objections in East Galway. It must be pointed out that there was significantly more support in Roscommon for the greenway than there was in East Galway. As reported in this blog the report from TII indicated that 74.3% of landowners in Roscommon accepted the route corridor. It was reported that there was disappointment locally following the ministers decision to pause the western end of the project. · Ballinasloe to Galway City: 110 km in length. Rural environs; Greenfield. Paused due to local objections. In Galway the acceptance of the route was much less favoured. Consultations with a sample of around 20% of the landowners (194 landowners) along that route corridor record that c. 27% of landowners would accommodate a route for the cycleway on their lands, c. 63% would object to it with 8% undecided. It is clear that there are challenges to rebuild the trust of the landowners again in East Galway. Based on the status above, it is hopeful that we will see a completed route as far as Athlone in the coming number of years. The local authorities in Dublin, Fingal, Meath, Kildare and Westmeath are working towards getting their sections complete in 2016 or 2017. These counties have put in place all the required planning and crucially the lands in questions are all in public ownership. It must also be mentioned that Waterways Ireland, who have officially ownership of the canal tow paths are very much behind the project. 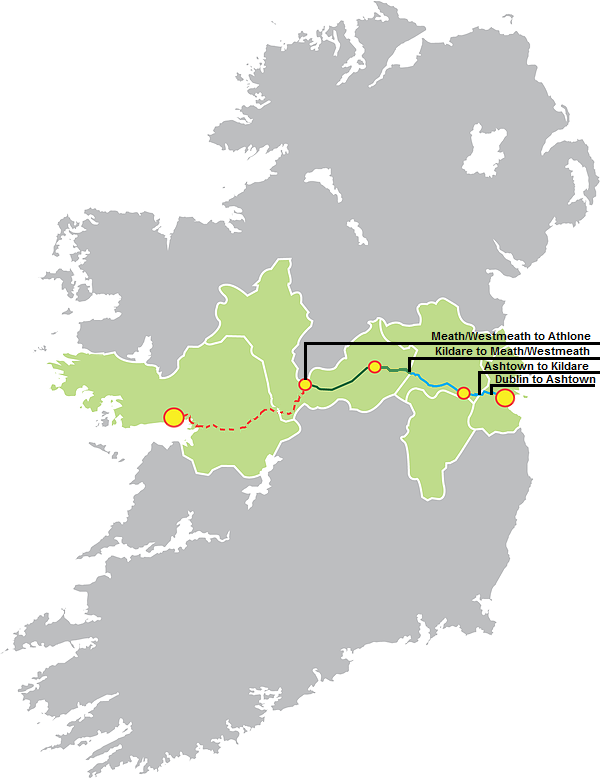 It is therefore highly likely that we will see the route opened as far as Athlone by 2017. The western end of the Dublin Galway greenway is a little less certain. In light of the entrenched opposition to the use of agricultural land for the route it seems unlikely that a simple solution will be found any time soon. Some campaigners have called for the use of the old N6 but cycling groups do not think that this is a suitable route. Other campaigners have questioned why the coast to coast route could not travel via Royal Canal all the way to Longford and from there join with the proposed Sligo to Athenry greenway at Charlestown. While other local representatives such as TD Denis Naughten have called for the use of state owned lands for the route in Roscommon and Galway. Another way to break the impasse could be the thoughtful interjection of the newly elected IFA President Joe Healy. Joe Healy is from Galway and could help build trust again between the authorities and the farmers in Galway. The project when fully completed is expected to cost around €100 million and has the potential to bring in tourism revenue of hundreds of million Euros annually to rural areas that badly need employment. As an example of the scale of the opportunity, over 5 million Germans take a cycling holiday every year. Domestically, the German cycling tourism market has sales of more than €9 billion annually. In 2010 just over one million Dutch people went on a cycling holiday with the potential market estimated at €1.7 million. Given the imminent arrival of a new government, it is hoped that new impetus can be put into this project. Fine Gael have previously promised over 100m Euros for greenway and blueway projects over the lifetime of the next government. It also has to be said that Pascal Donohue has been very supportive of this project and has recently reiterated that this greenway is a strategic project for the government. It is hoped that funding will now be made available for the authorities to continue with the work that they have started. Many campaigners are calling for more investment in rural areas so the project looks like it may have a new dawn in 2016.